Taxpayers could lose big, depending on number of jobs created, how long company in business. When the Legislative Fiscal Bureau wrote last week that it would take until at least 2043 for Wisconsin to break even on the Foxconn subsidies, they were summarizing a Department of Administration analysis that used the “best case” assumptions. Using the same methodology and most of the same assumptions, a new Wisconsin Budget Project analysis calculates that other scenarios within the range described by Foxconn could mean that the cost of the state subsidies would not be recovered until 2050 or 2058. Of course, the DOA analysis and our alternative scenarios all raise the question of whether we can ever expect to break even on the state’s investment and local costs. As many people have pointed out, tech companies aren’t the most stable employers, and Foxconn’s own record illustrates that point. With that in mind, our new analysis calculates how much Wisconsin would be in the hole if Foxconn pulled out of Wisconsin 25 years from now or, alternatively, if they pull out of Wisconsin in 2034 when the annual subsidy payments would end. 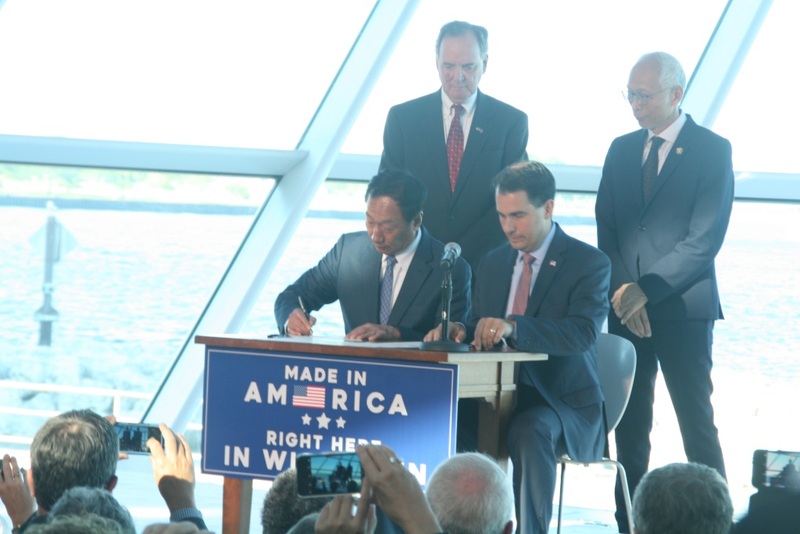 Foxconn has said that the new plant it wants to build in southeast Wisconsin could employ between 3,000 and 13,000 workers. In addition to the “best case scenario” of 13,000 new Foxconn jobs, we considered the possibility that they would employ 6,500 workers or 3,000 workers. The following table shows the different assumptions we used for those alternatives, and how alternative assumptions affect the amount of credits received by Foxconn, the annual change in tax revenue, and the length of the breakeven period for the state. New taxes – ongoing $115 million/yr. $75.3 million/yr. $46.7 million/yr. Click here to get a view a printable document showing how the state’s breakeven point for the Foxconn incentives could be far longer than 25 years, depending on the assumptions made. Note that under “alternative 1” we assumed that a 50% reduction in the number of Foxconn workers would result in a 25% reduction in the employment gains resulting from the new economic activity, and for alternative 2 we assumed a 50% reduction in the indirect employment gains. We could have based our analysis on even smaller numbers of new “indirect” jobs by simply assuming that the number of those jobs would be directly proportional to the number of Foxconn jobs. However, our premise is that a plant with fewer workers but more automation would still yield a significant increase in employment within the “supply chain.” Nevertheless, the number of “indirect” jobs would be much lower than assumed in the best case scenario because there wouldn’t be as much new income circulating in the area and that would yield a smaller bump in the employment that stems from the income gains. We do not claim that there is any particular economic expertise underlying our assumptions. Instead, we are simply engaged in a mathematical exercise to illustrate the key point that projections based on a particular set of assumptions can be far off the mark if those assumptions are incorrect. In other words, we have engaged in an exercise of risk analysis rather than an effort in economic forecasting. Another one of the challenges for anyone attempting to calculate a breakeven period for a set of business subsidies is the question of how much of the increased economic activity will be in Wisconsin and how much of the resulting increase in tax revenue will be captured outside our state. That’s especially relevant in this instance because the new plant will be very close to the Illinois border, and northern Illinois has a significantly higher unemployment rate than southern Wisconsin. The DOA analysis assumed that 100% of the new state tax revenue would go into the Wisconsin treasury, which seems unrealistic. Many of the workers at the Foxconn plant will commute from Illinois, and some of the new income they earn will generate sales tax revenue south of the border. In addition, some of the new “indirect” employment that the DOA analysis is counting on will almost certainly be in businesses located in Illinois. As a result, some of the indirect employment that is part of the supply chain will boost Illinois income tax collections rather than Wisconsin’s tax coffers. With that in mind, our alternative scenarios use slightly less optimistic assumptions about how much of the new tax revenue will end up in Wisconsin. Under alternative 1 we calculate that although the Foxconn subsidies would be lower, it would take until 2050 for increased tax revenue to fully offset the costs. And under alternative 2 – which decreases the number of assumed jobs and assumes that 10% of the growth in tax revenue would end up in the coffers of Illinois or other states – the breakeven point would be in 2058. However, a strong case can be made that the breakeven point under any of the three scenarios would actually be even further in the future since the methodology that we borrowed from the DOA analysis fails to account for the costs to the state of not using the money in question for different sorts of investments. Considering how quickly television and other flat screen technology has been changing, there’s a significant risk that the proposed Foxconn plant won’t be operating long enough to come close to offsetting the state’s massive investments. Assuming the new plant does not become obsolete even before 2034, that year is when the risk of Foxconn pulling up stakes and going elsewhere is probably greatest because it’s when the state would stop writing them checks for 17% of payroll costs. When a company’s business plan relies on such large subsidies, how confident can we be that they will remain in Wisconsin when those subsidies are gone? One of the surprising findings of our analysis is that the net loss for Wisconsin taxpayers from Foxconn were to end its Wisconsin operations in 2034 is in the same ballpark regardless of which of the three scenarios one assumes. Table 2 shows our estimates of the net cost to the state under each of the three scenarios if the Foxconn plant is no longer operating in 2034 or if it ceases operations 25 years from now. The difference between those scenarios becomes much clearer in later years, after the state has stopped paying job credits that are directly proportional to the size of the Foxconn payroll. Our calculations help drive home the point that it may be wishful thinking to believe that the huge subsidies Wisconsin is considering granting to Foxconn would be offset by increased tax revenue by 2043. And our analysis reveals that if the plant closes much before then, Wisconsin won’t come anywhere close to recovering what it spends for the annual checks that will be sent each year to Foxconn.